HEN astronauts venture outside their spacecraft to explore or work In space, they must be well protected. Otherwise they would quickly die in the hostile environment of space. A space suit is the astronaut’s protection and life support system. Going outside the spacecraft is called an EVA (extravehicular activity). 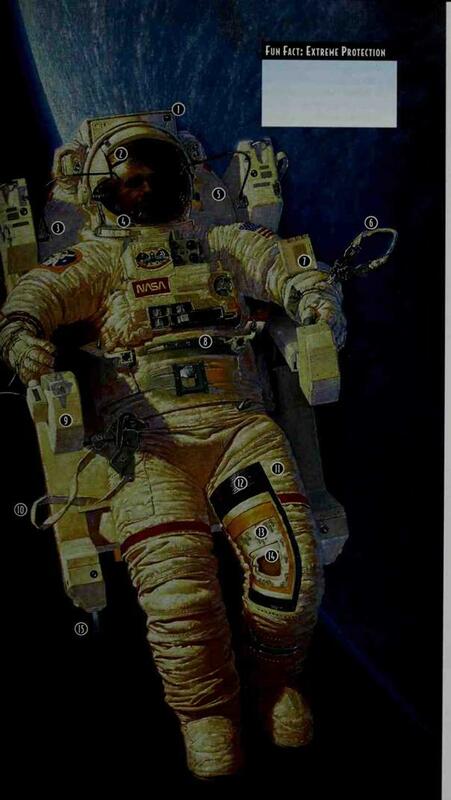 Wearing a space suit, the astronaut can survive up to 8 hours. Early space suits were bulky, with up to 15 layers of material, and uncomfortable to move in. Today’s suits have layers ol light, airtight material such as nylon and Tefljgn. ‘1 hey protect against extreme heat or cold and against the destructive impact of tiny particles called micrometeoroids. The space suit provides oxygen, a waste removal system, and radio communication. Astronauts can also move freely by attaching a chair like jet pack called the MMU (Manned Maneuvering Unit). It is propelled by small gas – jet motors called thrusters. I he astronaut controls them with buttons, much like video game controls. Flying at altitudes over 10,000 feet, early pilots had to breathe oxygen through face masks to survive in the thin air aloft. Above, pilot Wiley Post developed the first practical pressure suit for making his record high-altitude flight in 1935. Designed in 1960,this early space suit called the "tripod teepee"was not a success. A rigid metal cylinder with holes for the arms and legs, it was bulky and inflexible. The wearer here could hardly move his arms to use tools and could not bend over or sit normally. This space suit was worn by Gordon Cooper, one of America’s first astronauts. The suit had an aluminized nylon covering and 13 zippers for a snug rit. The gloves had tiny finger lights to help the astronaut see controls and charts. Ihe space su t the shuttle astronauts wear to work in space is the EMU, or Extravehicular Mobi Fry Unit. It provides air, protection from severe heat or cold, arid communication. Adding a jet-powered Manned Maneuvering Unit (MMU), the astronaut can move around freely outside. 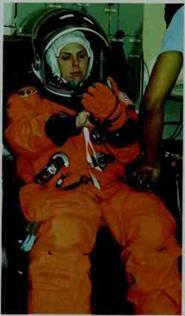 Astronaut M. S. Weber adjusts a glove in her pressure suit before getting on the space shuttle. The astronauts wear this suit at critical times such as launch and reentry. In some emergency situations, the astronauts can escape by parachuting out of the hatch.